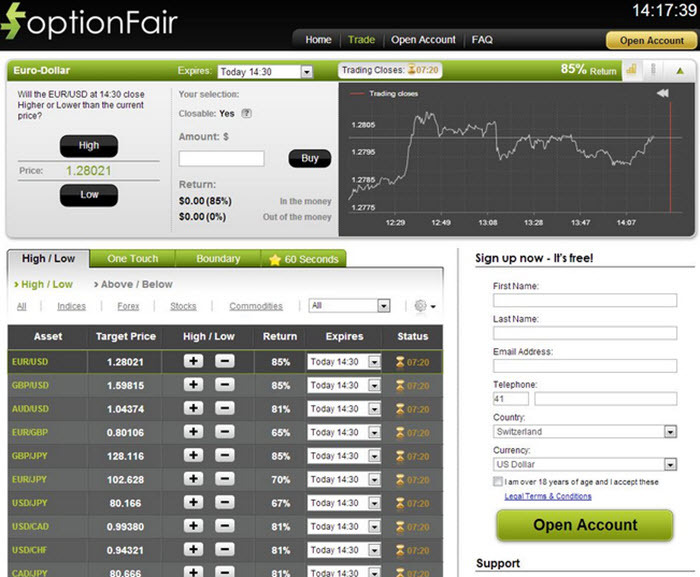 OptionFair sells binary options based on commodities, indices, currencies and stocks. One withdrawal per month (31 day period) is except from withdrawal fee. High quality bespoke trading platform created by TechFinancial. You can close out trades before the expiry date. OptionFair uses a bespoke platform created by TechFinancial. You start by selecting trade type from the ones listed in a tab-style menu on the left hand side. Once you have made a selection, that trade type will be brought to the forefront. Now, use the asset filter to narrow things down. The list below will automatically show the most popular trades, but you can use the asset filter to change this display according to your preferences instead. If you’re looking for binary options based on commodities, simply select commodities to display the available options. Once you have made a selection, the area right of the trading area will update automatically to show you current asset information. This is when you can adjust factors such as expiry time. Central and right hand side of the trading area is where you find trading buttons, asset price graphs and general trade information. The strike price is displayed between the two buttons HIGH and LOW. The amount and payout is displayed to the right of the trading buttons. High/LowWill the price of the underlying be higher than a certain predetermined level when the binary option expires? One Touch / No TouchWill the price of the underlying ever reach a certain predetermined point at any time during the lifespan of the binary option? High Yield TouchBased on the same premise as One Touch, but with higher risk and higher rewards. Some of the High Yield Touch binary options at OptionFair pay out 200%. Boundary (In / Out)Will the price of the underlying be within a predetermined span when the binary option expires? OptionFair has a trading mobile App for Android (from version 4.0) and another one for iOS. The apps are easy to use and will give you access to OptionFair’s full range of options and features directly on your mobile device. With credit cards, the minimum deposit is 250 GBP. With Skrill and Neteller, the minimum deposit is 250 GBP. With wire transfer, the minimum deposit is 500 GBP. With Western Union and MoneyGram, the minimum deposit is 1000 GBP. There is no minimum withdrawal amount, and you can make one withdrawal every 31 days without having to pay any withdrawal fee. For subsequent withdrawals, the withdrawal fee is 30 GBP per withdrawal. Withdrawal requests are typically processed within five days, which is a bit long compared to OptionFair’s main competitors. Weekly and monthly tournaments for traders, with cash prized awarded to the winners. As an OptionFair trader, you get access to extensive educational material that can help you become an even better traders. The Signal Service will alert you to potentially lucrative trades. Five different account types are available, each of them with their own benefits. The higher up the ladder you are, the better your perks. You cane for instance get to enjoy reduced fees and up to 5% increased payouts. The size of your initial deposit will place you within a specific account type. Members of the Elite Traders Club enjoy up to 1.5% cashback in trades. OptionFair has been publicly listed a since 2015. Its sister firm TechFinancials Group is now listed within the AIM market of the London Stock Exchange, and OptionFair sit under the same umbrella. To become and remain listed at the London Stock Exchange, a company must adhere to a strict set of rules, including rules regarding transparency. OptionFair is licensed by CySec and must adhere to the European Union’s MiFID regulation. At OptionFair, client funds are kept segregated from company funds. This provides the clients with a higher degree of protection in case of corporate bankruptcy or similar.